I LOVE getting to be a part of a couple's big day! My piano & vocal style is pretty mellow, and best suited for ceremonies, cocktail hours, and VERY low-key receptions. If you want someone to get the party started with dance hits, I'm probably not your girl. If you are looking for something laid-back, with cover music ranging from the 1920s to today's hits, then let's chat! 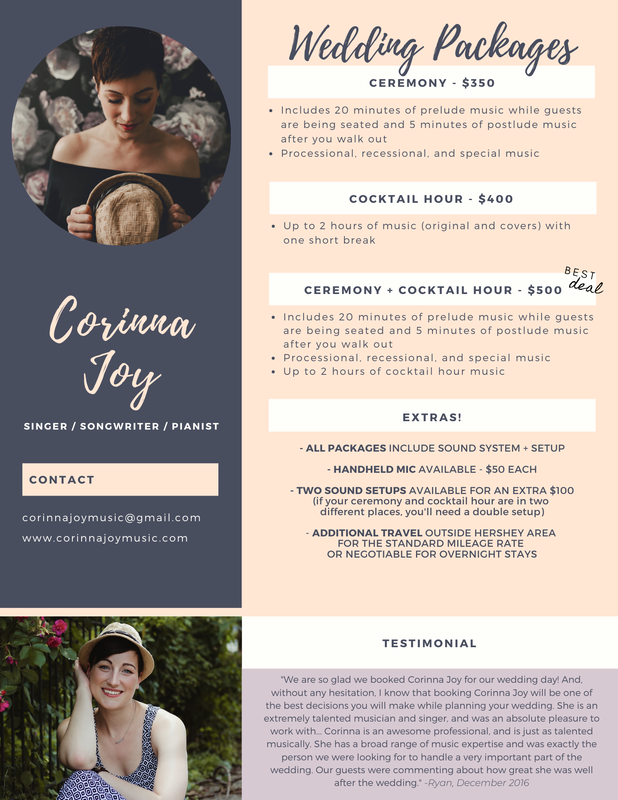 I've got about 400 selections in my repertoire, and try to tailor the kinds of songs I choose to the kind of crowd you're expecting--but I'm always happy to learn one or two special songs for your ceremony or first dance. Does it sound like I might be a good fit for your wedding? Take a look at my pricing and packages below. Then, use the contact form to get in touch with me and reserve your date! "Elegant and impressive" - "Corinna is absolutely amazing!! We used her for our ceremony and cocktail hour. She played keyboard and sang. I can’t say enough about how great she really is!! She has such a wide range of music selection that made it easy to decide on songs for the wedding. Highly recommend Corinna!!" "Corinna was absolutely fantastic! All of my guests raved over how good she was and how much they enjoyed her performance at our ceremony. She was quick to respond to emails and prompt. I absolutely recommend her!"